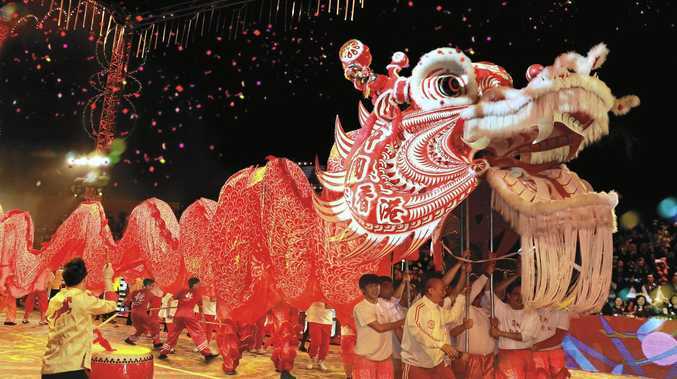 COLOURFUL festivals, big sporting events and new cultural hubs are just some of the reasons to visiting Hong Kong this year. Then there is the fabulous shopping and eating. 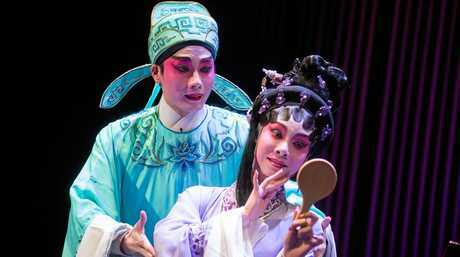 The Xiqu Centre in West Kowloon is a platform for the conservation, promotion and development of Cantonese opera and other genres of xiqu (Chinese traditional theatre) in Hong Kong and beyond. There performances to enjoy inside the striking building which blends traditional and contemporary elements. Down at Tsim Sha Tsui the Avenue of Stars has a new collection of celebrity handprints and statues on display. Visitors will be able to step back in time and relive the successes of past Hong Kong movies, set with the backdrop of the stunning Victoria Harbour. The Peninsula Hotel's newest guest experience, a 15-metre powerboat, is available for daily harbour tours. The Mills project has seen the former textile mills turned into a destination for innovation, business, experiential retail, arts, culture and learning. The former mills have been transformed into a single complex incorporating The Mills Fabrica, The Mills Shopfloor and the Centre for Heritage, Arts & Textile. The Peninsula Hong Kong is the first luxury hotel in Hong Kong to offer a trinity of deluxe transportation options; the existing fleet of Rolls-Royce Phantoms, a customised helicopter and now a yacht. 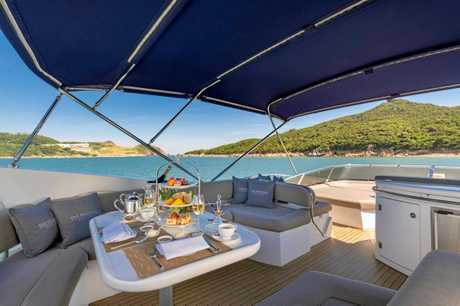 The Sunseeker Manhattan 60 is a 19m cruiser that can carry up to 15 guests each evening to enjoy a two-hour evening cruise featuring the Symphony of Lights on the mesmerising Victoria Harbour during the Harbour Sunset Cruise. Join the grandchildren, or go alone, and step into popular Disney stories at Hong Kong Disneyland Resort. It has new immersive attractions and exclusive Disney experiences. 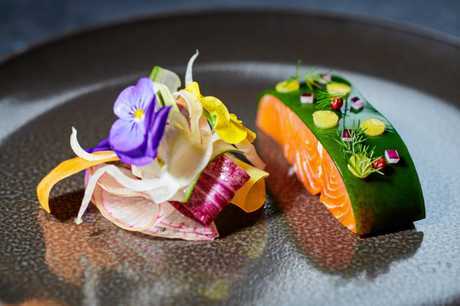 Chef Bruno Menard's kitchen, lightly cooked Tasmanian trout, chlorophyll jelly, wasabi. Japan's ramen noodle champion Hayashi Takao and leading specialist in Japan's national culinary artform, Matsumura Takahiro, have launched Ramen Cubism at a chic basement venue in Wellington Street, Central. Daarukhana, a contemporary concept delivering a new take on Indian foodhas opened in Wan Chai. It features lofty interiors while the kitchen shrugs off convention by using ingredients rarely seen in Indian cooking. Guests can indulge in pairings including chili honey glazed French langoustines with South Indian beans as well as other culinary innovations. Former three Michelin Stars Chef Bruno Ménard has joined the Junon, a establishment that combines live musical performances with fine-dining cuisine. Chef Bruno crafts seasonal menus supported by premium quality, fresh ingredients sourced from Hong Kong and around the world. Mokutan, a Japanese Izakaya, is open in Tsim Sha Tsui at Empire Prestige. It offers a repertoire of high-quality, seasonal specialties, highlighting three affordable Omakase menus. Peking Garden in Star House, Tsim Sha Tsui, is celebrating its 40th anniversary. It offers dishes inspired by Beijing's Imperial Cuisine, characterised by its elaborate detail and craftsmanship. Occupying a multi-storey complex in Kowloon City, Sanwa Jo has five master chefs at the helm, the curators of the three Japanese gastronomic classics: sushi, teppanyaki, robatayaki and washoku. Celebrity Japanese pâtissier-chocolatier Hironobu Tsujiguchi has opened four Super Sweets Galleries located in Tsim Sha Tsui, Central, Causeway Bay and Shatin. The celebrated Iron Chef confectioner, introduces a range of his signature cakes, roll-cakes, desserts, pastries, truffles and chocolates 'with a French twist'. Fans of holistic tea purveyor Basao tea can now enjoy a cuppa of its exceptional single-origin clean-grown brews at the brand's first dedicated teabar located on Moon Street, Wanchai. It uses exclusive fine teas from hand-picked partner growers in China, Taiwan, Nepal, India and Japan. Taiwanese drink maestro Angus Zou has partnered up with Tasting Group's Antonio Lai to unveil the city's first cocktails on tap bar concept, Draft Land. They serve simple, no-fuss, high-quality cocktails at a reasonable price with seasonal pre-batch-only and garnish-free cocktails on tap. 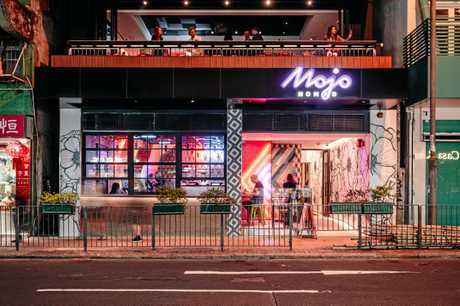 Mojo Nomad Central, a ground-breaking concept that turns the traditional hotel model completely on its head, is now open on Queen's Road Central. It features exceptional food and beverage offerings and 24-hour facilities including a contemporary fitness centre, laundry area and an expertly appointed co-working space. 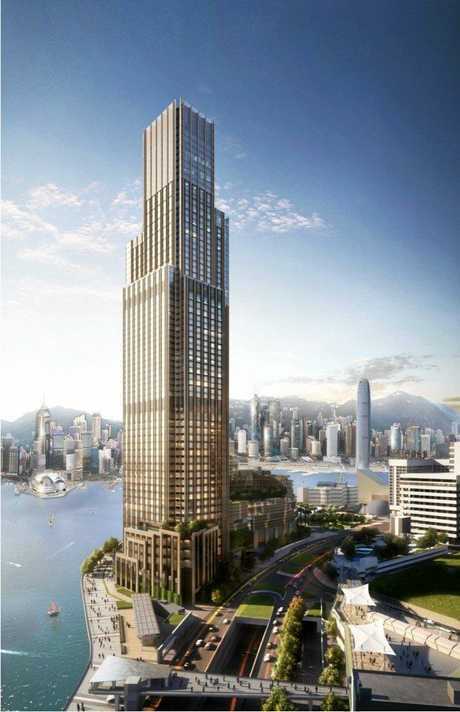 Rosewood Hong Kong, a new ultra-luxury property situated within the Victoria Dockside arts, design and conceptual retail district, will open on 17 March. It has eight restaurants and lounges plus recreational facilities including Asaya, Rosewood's holistic wellness concept, a fitness centre and swimming pool. For more information go to discoverhongkong.com/au.